Next year Outside Edge turns 20! 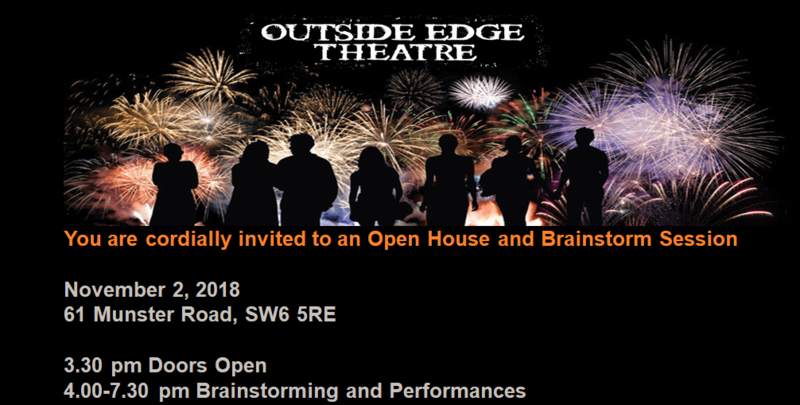 To mark the year long run-up to this event, we’re inviting participants past and present, trustees, patrons, friends, staff, supporters and other local service users to join us for some fun on November 2, 2018 to celebrate the company’s history and help us plan the future of Outside Edge . We want to hear your ideas, dreams, and creative aspirations for our company. For the afternoon we’re turning 61 Munster Road into the creative hub for Southwest London showcasing the incredible talent in our community! We’re hosting performances, offering a pot luck dinner and providing open discussion spaces to hear what you have to say about what you want from Outside Edge in the years to come. Following the activities at Munster Road, anyone who’s interested, can join us around the corner in Bishops Park for Hammersmith and Fulham’s annual fireworks display. It’s an open house, so there’s no need to RSVP. Children, friends and family are all welcome! Please remember that as with every Outside Edge event you must be abstinent on the day in order to join us. If you want to perform or prepare food please let us know by Friday, October 26th through admin@edgetc.org to let us know what you’ll be performing or cooking for the pot luck dinner.